The tornado in the timeless classic movie, "The Wizard of Oz," is remarkably real-looking. So much so that it made the list of Weather Channel's 100 Biggest Weather Moments several years back. The "tornado" was actually a 35-foot tall cylinder of chicken wire, covered with black cloth and spun around by an electric motor. Special effects gurus blew dust through the tube and out the bottom, making it appear as if dirt was being thrown about as the storm ripped through the nearby fields. To make the twister look even more menacing, technicians shifted the tornado's top or base through a slot in the floor and a hole in the studio ceiling, churning it about. 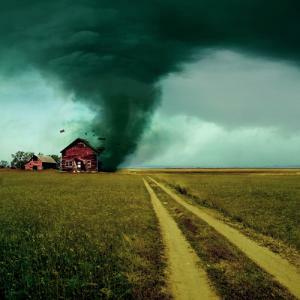 Speaking of tornadoes, there's recently been a whirlwind of activity with respect to mobile wallets, and we expect to see a barrage of competition rain down in the coming months. Here's a rundown of what's been happening since Apple Pay stirred the competitive waters with its Oct 2014 launch. Not to be outdone by Apple, phone-maker Samsung announced in Feb its foray into mobile payments with the acquisition of LoopPay. Samsung Pay will be available this summer on the Samsung Galaxy S6 and S6 Edge. With LoopPay's technology, device owners will be able to make payments anywhere credit cards are accepted. This should give it a leg up on Apple Pay, at least for the short term, because the vast majority of stores don't currently have the technology to support the Near Field Communications (NFC) technology that Apple uses. A number of banks, along with MasterCard and Visa, have signed on as launch partners for Samsung Pay and the list is growing. Speaking of Apple Pay, several hundred banks, including some smaller institutions have signed up with their cards. Certainly, NFC has a long way to go before there's universal acceptance, but that day will come and forward-thinking banks will want to be prepared. Large banks, for sure, are hedging their bets by being part of both Apple Pay and Samsung Pay, and it's certainly an option worth exploring for smaller banks. Google, meanwhile, is another wildcard. It's had a mobile wallet for a few years, but is making a renewed push for acceptance by acquiring the technology of carrier-backed joint venture Softcard. As part of the deal, Google acquired Softcard's technology, while JV partners Verizon Wireless, AT&T and T-Mobile agreed to load the Google Wallet app onto Android smartphones running KitKat or higher in their stores later this year. Google Wallet works with all bank accounts and major credit and debit cards so it will be interesting to see whether the Softcard deal allows it to gain the traction it has lacked so far. Then there's PayPal, which recently announced a deal for Paydiant, a Mass.-based mobile payments provider that allows merchants and banks to deploy their own secure mobile wallet solutions under their own brands and in their own apps. Paydiant is also the technology provider for Current C, a merchant-backed competing platform that's an ongoing thorn in Apple Pay's side. At this juncture, it's hard to say who the winning mobile wallet players will be, but we can say with certainty that fast-moving mobile winds are going to continue to swirl this year. Banks need to stay informed and alert so they don't get swept aside in this torrent of activity. Treasury yields fell 2bps as manufacturing output came in substantially lower than what the market predicted. Yields are down 1bps while investors look ahead to housing starts. Bank of America reported net income of $3.4B (vs. loss of $276mm YOY). Other data: ROAA (0.64%); ROAE (5.35%); efficiency (73%); NIM (2.17%); loan loss allowance to loans (1.57%); branches (-5% YOY); employees (-8%); loans (-4%); 31.5mm active online customers (+3%); 16.9mm active mobile customers (+13%). US Bancorp reported net income of $1.4B (+2% YOY). Other data: ROAA (1.44%); ROAE (14.1%); efficiency (54%); NIM (3.08%); loan loss allowance to loans (1.77%); banking offices (+3% YOY); employees (not reported); loans (+5%); active online customers (not reported); active mobile customers (not reported). Regulators from the Fed are once again reminding bankers to be sure to assess the risk posed by non-maturity deposits in a rising rate environment. The fear is that such funding and liquidity could flow out of banks when interest rates begin to rise. Our advice is to test, analyze and have a plan in place that makes sense (avoid brokered CDs and wholesale funding as solutions to this issue). The Department of Labor has released a proposed rule that would require retirement advisors to assume a fiduciary role with clients. This move is an attempt to prevent advisors from selling products to their clients that would create a conflict of interest. Prior Fed Chair Ben Bernanke is out on the tapes responding to discussion about why bond yields are so low. He cites a number of factors that include: "...minimal investor concern about inflation; relatively low uncertainty about the likely future course of interest rates; a strong global demand for safe, liquid assets (for use as international reserves, for example, and to satisfy regulatory requirements); and quantitative easing programs by central banks." Now you know. The CEO of Prudential Investment Management says global investors are very concerned that regulatory changes have resulted in the unintended consequence of "a dramatic decline in liquidity" in the bond market. Investors and regulators alike worry about the unintended volatility that could occur in times of market stress.